Send us a picture of your finished work and any comments concerning your experience with our products. We will publish your input here. 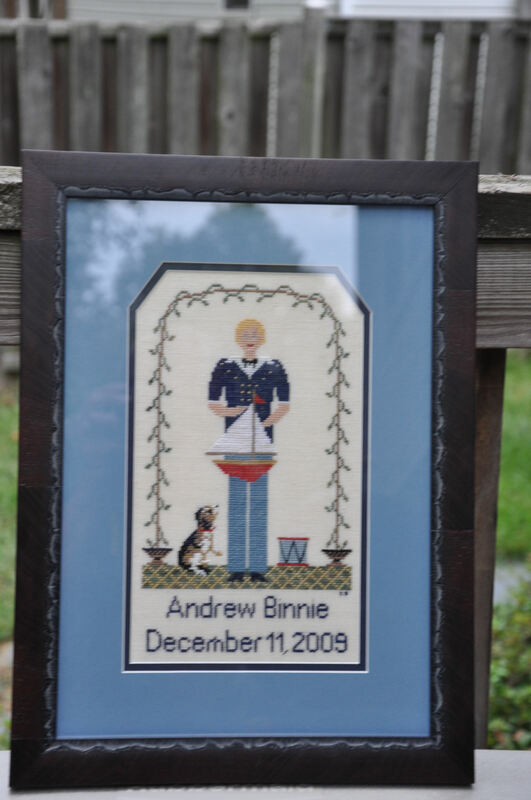 our charts will inspire others to stitch an heirloom and build a legacy. Pyn Keep beautifully stitched by Bertie Button. Bertie said that the Mary Bullock 1829 Pyn Keep was “The perfect project on a cold and miserable Bank Holiday weekend”. We think Bertie is right. Her Pyn Keep is delightful! Stitched on 36ct Lakeside Examplar Linen. Over 2, 2 strands of DMC. My sister Pat lives in Elburn, Illinois. 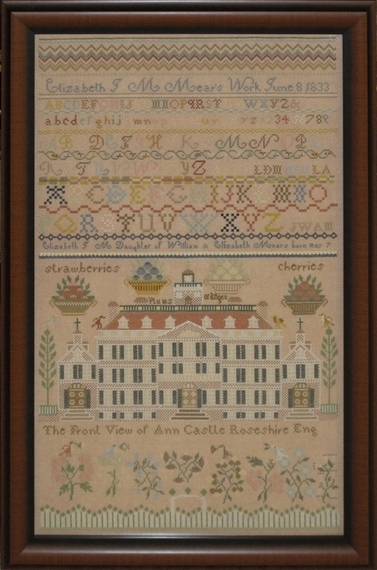 Her favorite part of the sampler was the top part, because of the variety of different stitches. She said she was fine with using the 2 threads everywhere else, but if she had to do it over again, she only use 1 thread for the house. We think it is just fabulous! Normally one thread of DMC should be enough to cover when working on 36 count linen. 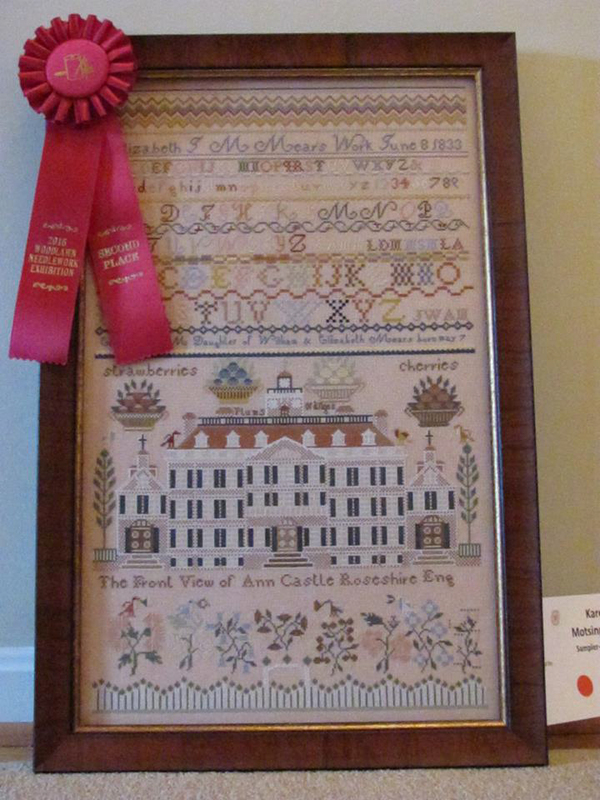 We already have Karen Motsinger’s Mears sampler on the web site, but I want to add this one to congratulate her because she won a prize at Woodlawn this year. Melissa Heuer Coyle completed a most beautiful rendition of Elizabeth J.M. Mears . Elizabeth says "I varied a few of the colors and added a little sparkle here and there. I loved stitching the big building, it was, though, at times like chewing a whole cow - one bite at a time - wondering if there was an end." So worth taking the first scrumptious bite! 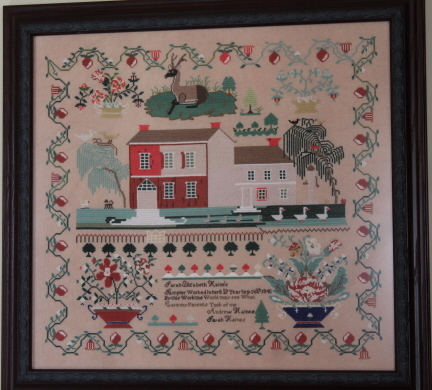 Pam Ellis worked a beautiful Liddy Rodes 1814 Virginia sampler. 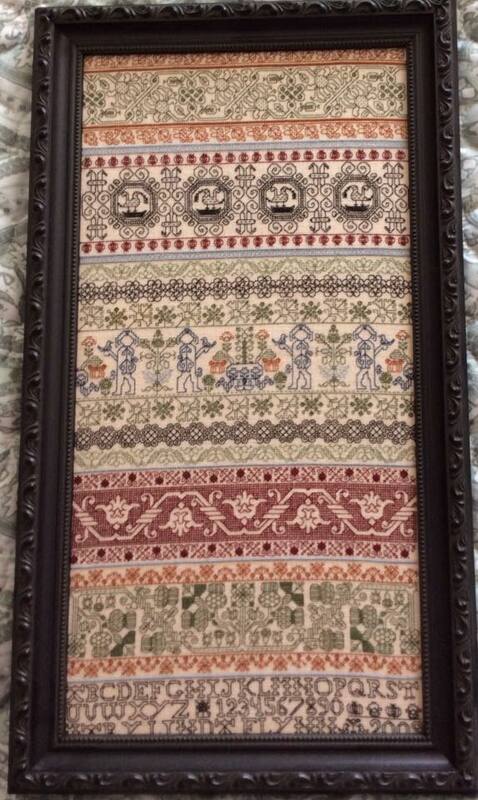 Pam said she loves the quirky look to this sampler. 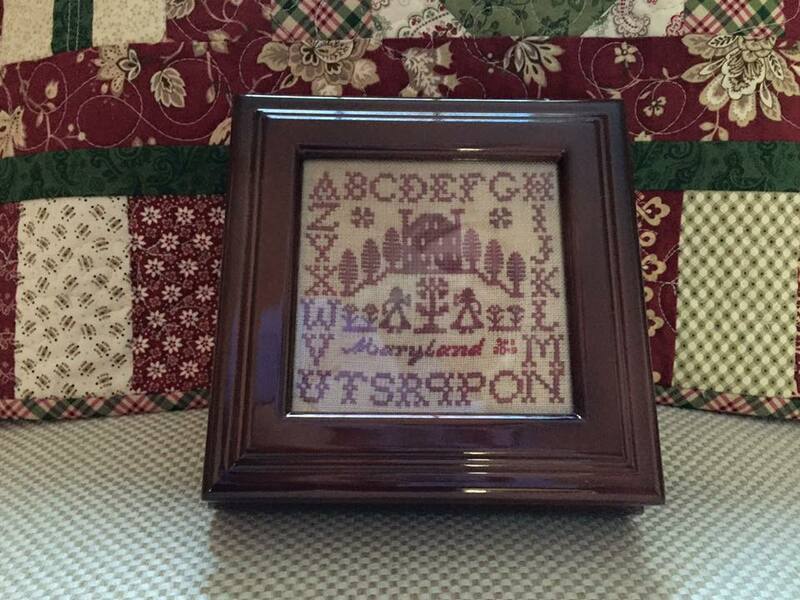 Stacy Hendon Diokno stitched an adorable Little Maryland. She made some changes, but then that is what makes it special. Love the quilt too. 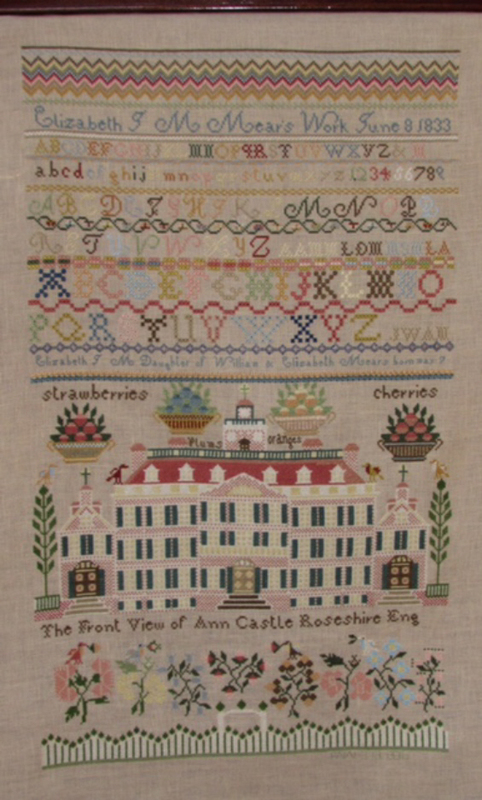 Mary Flynn embroidered an absolutely gorgeous Queen’s Garden sampler. 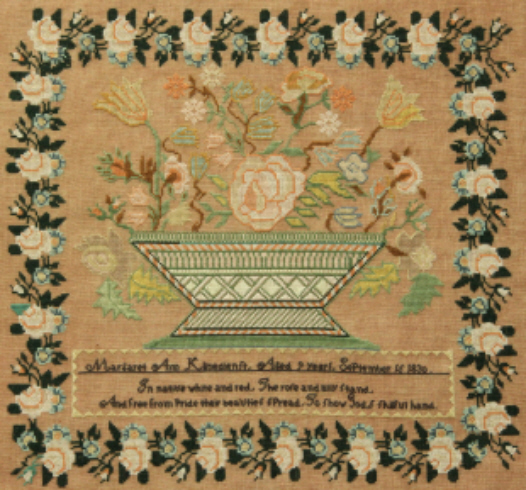 This sampler is near and dear to my heart. 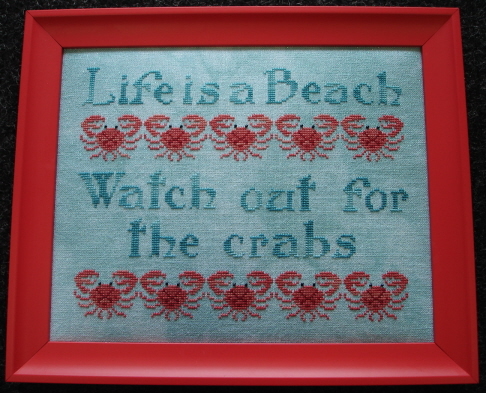 It is the first sampler I designed after not being able to stitch for three years. A wonderful rendition of Elizabeth J M Mears expertly stitched by Donna Battersby Bennett. 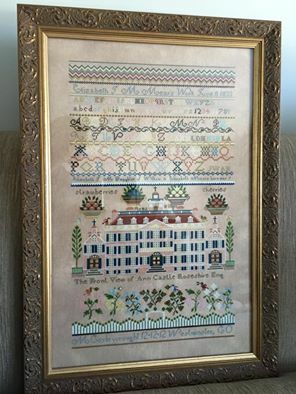 So nice to have met you at Thistle Needleworks, Wethersfield, CT.
Beautiful embroidery by Karen Motsinger. 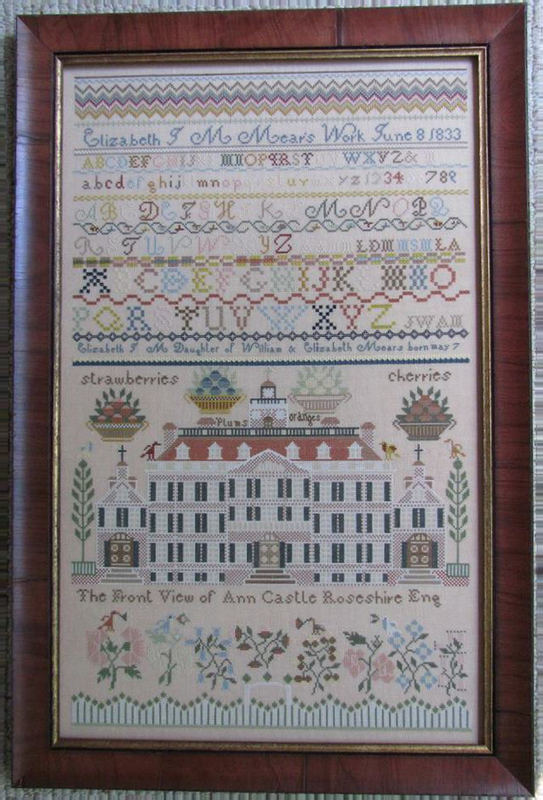 A truly stunning Elizabeth J M Mears 1833 sampler. Thanks Karen for sharing your gorgeous work with us. 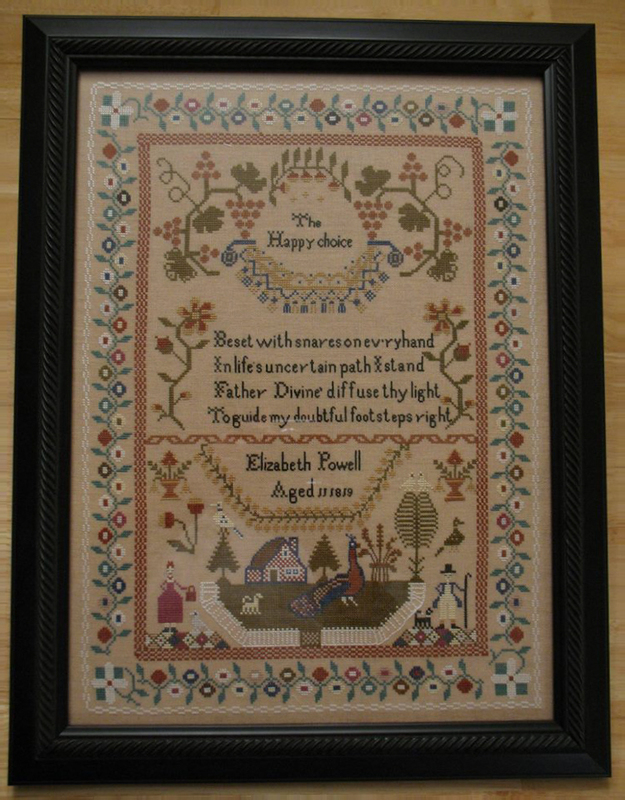 Irene Jones worked a beautiful Elizabeth Powel 1818 sampler! First published in Sampler and Antique Quarterly Vol.56, Fall 2009. 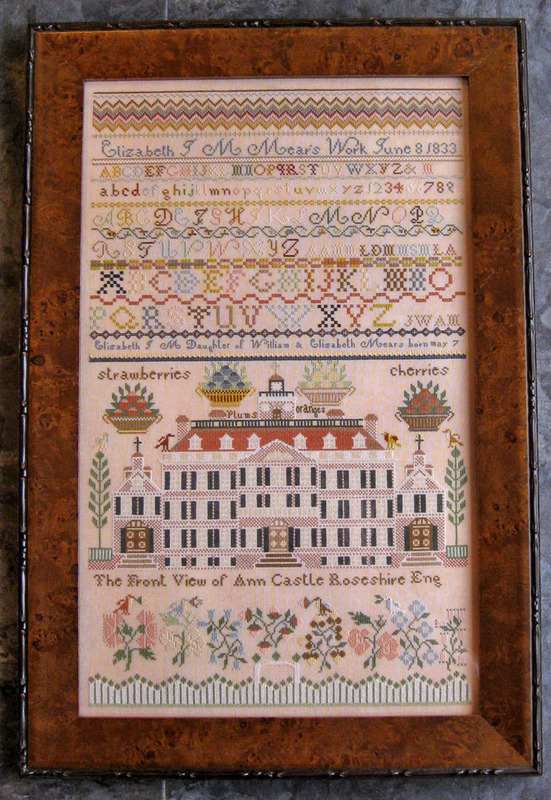 The chart is now available directly from Queenstown Sampler Designs. Vanessa Roper in Alabama wrought a stunning Elizabeth J.M. Mears. She used Lakeside Linens - Vintage Examplar. Teresa Wood embroidered a gorgeous Harriot Redfearn 1830. Anne Cannizzaro made a stunning ornament from a QSD complimentary chart - Mermaid Angels. We adore the beautiful finish! "I truly love your samplers!!!! They are just wonderful to stitch!" Thanks - We think your Mary Pets and Sarah Haines samplers are wonderful also. Mary Jo did fabulous work on these beautiful big girls. This is Melinda Zachary's terrific model of QSD's "Life is a Beach". Melinda has it hanging on the wall of her shop - The Stitching Post in Baltimore, MD. Melinda used 28 ct Crystal Glacier Cashel from Picture This Plus. The threads are Crab Cakes and Really Teally from Crescent Colours. The eyes are black beads from Mill Hill and the contrasting color for the inside of the crabs is DMC 3777. 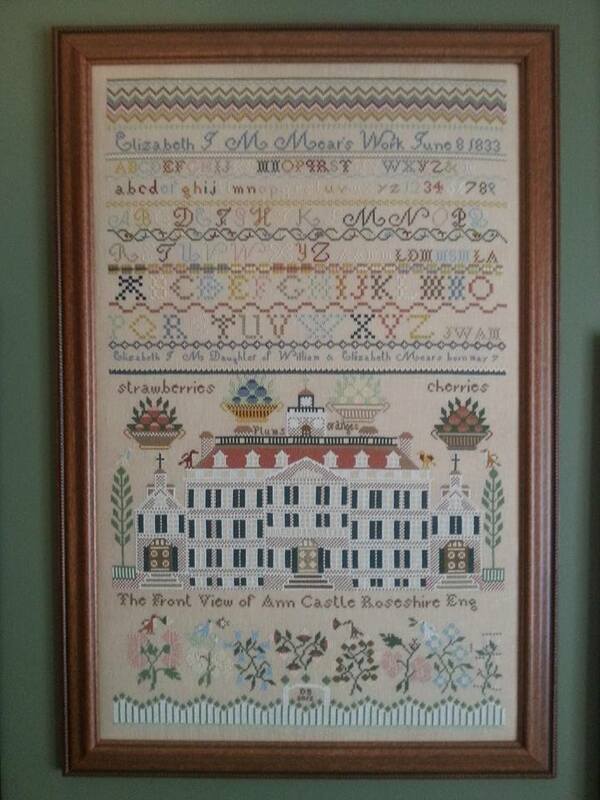 This is Betty Amstutz's beautiful Sarah Haines sampler.` Betty is from Lancaster. PA. The wonderful frame was handmade by a local craftsman. The sampler hangs proudly on her staircase. Congratulations to John who earned a 2nd place with his second working of Margaret Anne Klinedienst. John also worked the QSD model that appeared in SANQ Winter 2011. John also won three more ribbons (one first & two seconds). John, you are brilliant and amazing. I also want to congratulate Pat Lerch from the Delaware Valley Historic Sampler Guild. Pat took a First Place ribbon with her Queens Garden. Congratulations also to Debb Rose who took a Third Place ribbon with here Mary Pets 1831. All your works are beautiful! Here is Elizabeth Mears by Pat Judson from the Eastern Shore of Maryland. Elizabeth Mears by Carole Watkins from California. 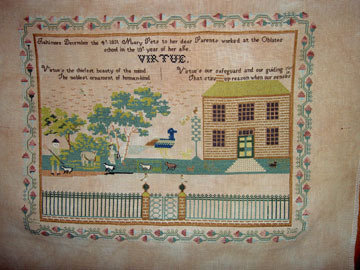 Carol Justice stitched the Mexican Sampler c1850. Deb Williams stitched the Mexican Garden. 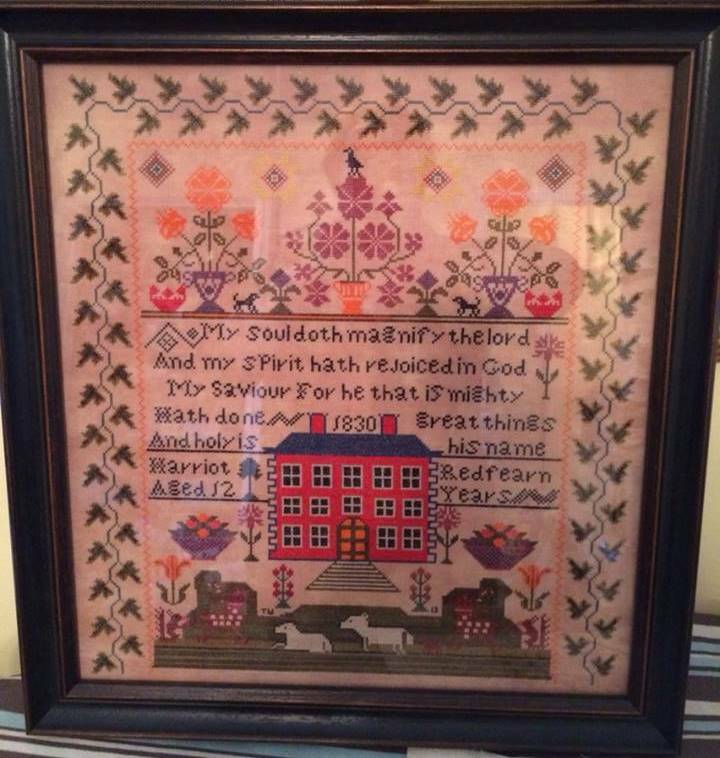 Both are from the Attic Needlework shop. While the girls were discussing samplers and other fine needlework, Bubba found these examples of natural Arizona needlework. Congratulations to John Kazmaier. John won a red ribbon, 2nd place, with the Mears sampler. He took second only because he took first place with another entry in the same category. John took a total of five awards with all four of his entries this year. We visited John Kazmaier's home in December 2010. This is a picture of the entry-hall just inside his front door. 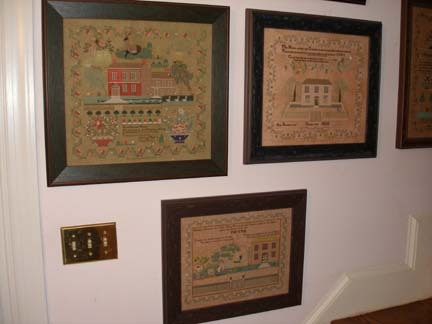 As you may imagine - his home is filled with his exquisite award-winning needlework. Cindy modified "William" in order to celebrate the birth of her friend's son. I think she did a wonderful job and personalized the sampler as I hoped everyone would do. 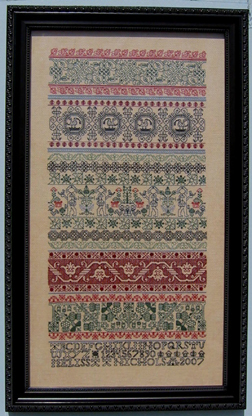 Carol did a wonderful job with the Mexican c1850 sampler. She used her artistic license and changed colors to match her tastes. We encourage people to sew their samplers using the colors they like. It makes the sampler "yours". 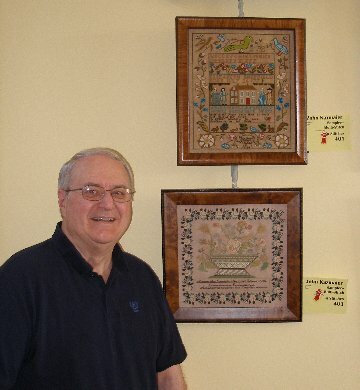 Carol is a customer of Jean Lea - Attic Needlework & Collectables of Mesa, AZ. John Kazmaier Takes First Place at Woodlawn! 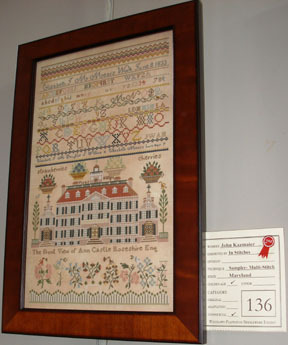 John K. received a First Place ribbon for his exquisite work in completing his reproduction of Hestra Harmer at the 2009 Woodlawn juried needlework show. CONGRATULATIONS John! Saturday, February 16, 2008: I finally did it! DMC on Sarah Haines and the rather dark antique green background (linen) really toned down the bright colors--especially the blue. I also used a darker color for the unpainted portion of the house to give more of a contrast to the window frames and the house--you couldn't tell the difference in the floss I was using. You did a great job on this chart--for example widely varying herringbone stitches but with very easy to use instructions/illustrations/notes. I had stitched Ann Barriere several months ago but put it aside without doing the surface embroidery even though I had done some embroidery. It was a challenge because the linen was so soft but I made the best of it. Okay, I could have used a hardener but didn't take the time. It looks great so long as you don't get closer than about six feet! I made a few changes: 1. The little girl's dress disappeared into the canvas because of the shade of linen I chose, so I simply added a few more xstitches to the bush to make her stand out. 2. Also, the strawberries around the outer border disappeared into the canvas so I changed their color 3. And finally, the thoughts of doing the roof in xstitches just overwhelmed me so I did the roof in long arm xstitch over 2. 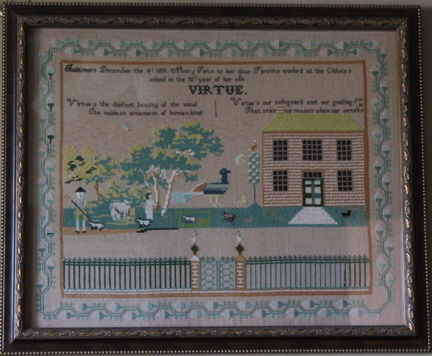 Melissa Nichols entered the 2008 Woodlawn Needlework Show in Virginia. nbsp; She was awarded a First Place ribbon for her exquisite work completing the Queens Garden. A picture of her award winning piece is shown below. Congratulations Melissa!